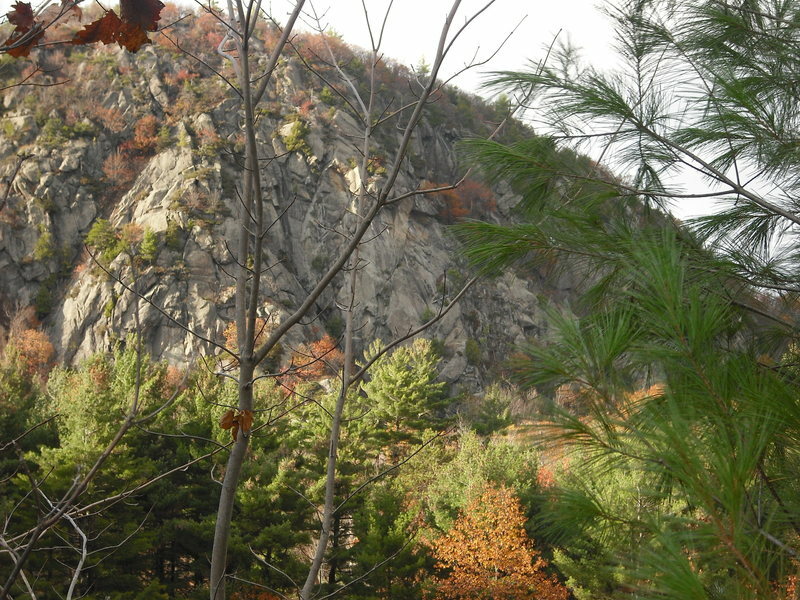 Be aware that several cliffs throughout Adirondack State Park observe seasonal closures to allow for Peregrine nesting. Such cliffs include: Moss Cliff, Poke-O-Moonshine and The [Lower and Upper] Washbowl Cliffs. Check with the New York Department of Environmental Conservation website (www.dec.ny.gov) before attempting to climb at any of the aforementioned areas during the months of May through August. The Dacks. An untamed tract of public and private land spanning a topography larger than Vermont. The Park is preserved by legislation from 1885 declaring that the lands of the preserve "be forever kept as wild forest lands." That statement by the Forest Preserve was the formal beginning of what has now become a 6,000,000 acre wilderness--the largest state park in the lower 48. Click here for a Google map showing the park boundary. Adirondack Park Regions: A: Lake Champlain Region B: Chapel Pond Pass C: Keene Region D: Wilmington Region E: High Peaks Region F: Lake George Region G: Indian Lake Region H: Southern Mountains I: Old Forge Region J: Cranberry Lake Region K: Northern Region The Adirondack park is prized more for the recreational potential it offers than for the economic value of its natural resources. That being said, don't come the Dacks thinking that you are going to be welcomed with large welcome signs, visitor centers every 100 yards, and tourist shops around each bend. On the contrary; the Adirondacks are a quiet swath of rugged terrain that offers a very humbling and traditional approach to rock climbing. The sheer number of crags and walls within the Parks' boundaries is enough to satisfy someone for a lifetime. There are well over 250 climbing areas in the Adirondacks, all of which deal a very unique experience from the next. Areas such as Keene Valley and the Cascade Lakes Region offer the largest variety of climbing, allowing a climber to sample massive multi-pitch slab adventures and desperate single-pitch test-pieces within minutes of the parking lot. There are also numerous backcountry crags such as Wallface, Gothics, Big Slide, and The Cranberry Lake Region that test climbers fortitude, patience, stamina and route-finding skills. On many of these committing routes, don't expect the climbing to be clean 100% of the time. It is best to carry a brush for cleaning and a healthy understanding of adventure. Unlike many other climbing areas across this country, there is no epi-center for the climbing here. One could argue that Keene Valley is the central locus for climbing in the Dacks, and this very well may be the case. However, you'd be hard-pressed to find teeming hordes of chalkbags spraying beta from below. Those who have climbed before you have tried to leave very little evidence of their passage, save for a few slings growing from the side of the cliff. You won't find overly-chalked holds, or tick marks marring a route from top to bottom. What you will find in the Adirondacks is adventurous, character-building climbing that carries with it the very essence of traditional rock climbing. 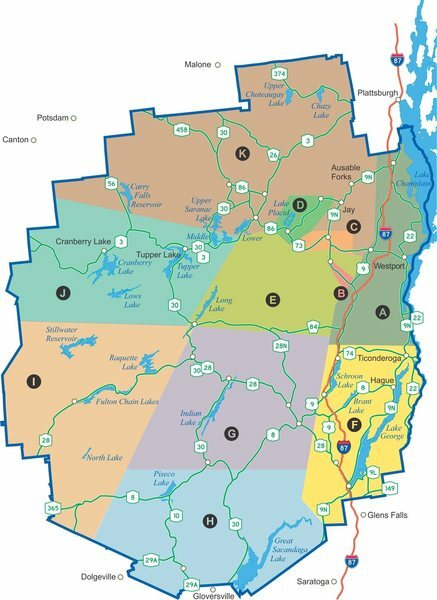 In April of 2008, Jim Lawyer and Jeremy Haas released the most comprehensive guidebook for Adirondack Park to date (www.adirondackrock.com). Now in its second edition, this labor of love meticulously documents every route, crag, and trail system within the parks vast boundaries, and it invites the reader/climber to become intimately involved with each route thanks to the stories and reflections scattered throughout the guide. Due to the size of the Adirondack Park, it has been subdivided into regions consistent with the regions used in the local guidebook. The Dacks are big, REAL BIG, and can be accessed from various points in New England and from the flatlands below us. If you are coming from the south, Interstate 87 (The New York Thruway) will deposit you in the Park. Traveling from the east, there are several ways, all of which offer similar travel time, that get you there. The Charlotte, VT Ferry, The Burlington, VT Ferry, and the Grand Isle, VT Ferry all drop you off along the eastern precipice of the Adirondacks. Once across Lake Champlain, find your way to Route 73, the central corridor through the Park proper. From the west, travelers can take Route 3, 28, or 8 depending on the destination you wish to visit. At this point you should refer to the detailed descriptions for each area, as many of the areas are sprinkled along, or right off Route 73, or off Route 9 or 9N located just to the north and east. Adirondacks in the Fall. Near Indian Lake, NY. Topo exist? its a private?